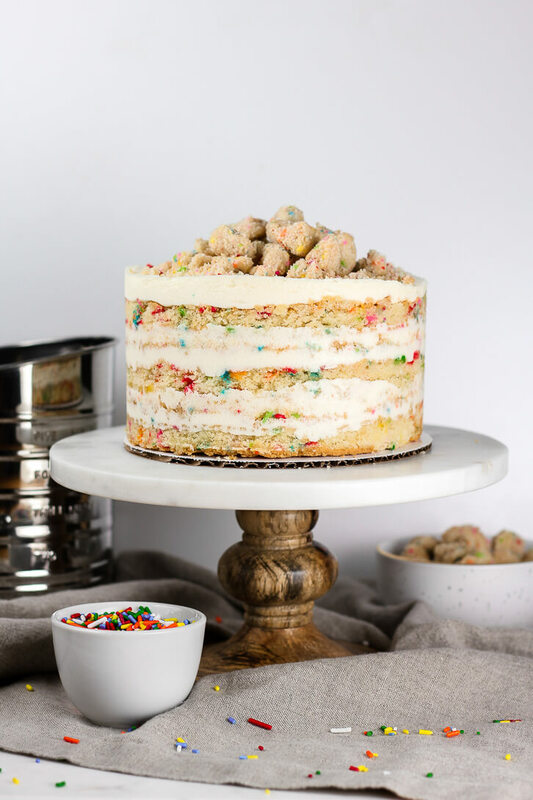 An adaptation of the famous Milk Bar birthday cake: melt-in-your-mouth layers of Funfetti cake with birthday cake soak, topped with vanilla cream cheese frosting and birthday cake crumbs. Last week, Mr. Flour Covered Apron got to celebrate his birthday with two birthday cakes! Apparently, that is the benefit of being married to a cake blogger! Since cake is basically an every day occurrence in our household at this point, I wanted to do something a little more special for the occasion. So, I decided that finally trying the Milk Bar birthday cake recipe I’ve had my eye on would be the perfect way to celebrate my Funfetti-loving husband. Milk Bar’s special naked cakes are made by stamping out circular cake layers from a larger sheet cake, which gives the edges an unfinished, yet clean look. To further help get the most perfect sides ever on this naked cake, it’s stacked inside a ring of clear acetate (a type of flexible plastic used for some baked goods). And in the middle of the cake, the layers get a milk soak before being topped with frosting and cake crumbs, which add the perfect crunch. Swapped out the shortening in the original recipe and stuck to butter and oil instead. Used pure vanilla extract instead of imitation clear vanilla (Milk Bar swears by the clear stuff for getting the brightest white frosting and a “box-mix” taste, but I’m all about the real stuff). Made a more classic vanilla cream cheese frosting (in order to omit glucose, corn syrup, and citric acid) that has just a subtle cream cheese taste. And it came out great!! Ben absolutely loved this cake and said that for him, it only comes second to my chocolate chip cookie dough brownie cake (nothing can ever beat cookie dough in his book!). We both loved how the milk soak made the cake layers extra flavorful and moist (but definitely not soggy!!). And how the soft cake layers perfectly contrast with the crunch of the birthday cake crumbs between each layer. The Milk Bar method can totally seem intimidating at first, but in some ways, I actually found it easier than a typical layer cake. For real! Stamping out the cake rounds couldn’t be easier, and the acetate ring provides the perfect, helpful guide for stacking your cake. Plus, without any frosting on the sides, it’s an incredibly low maintenance cake when it comes to decorating. I finally got to cross off making a Milk Bar birthday cake from my bucket list, but I’m sure I’ll be trying some more variations on this method to come! If you give this recipe a try too, tag @flourcoveredapron on Instagram to share your creations! Preheat oven to 300 degrees Fahrenheit and line a rimmed baking sheet with parchment paper. Using a stand mixer fitted with the paddle attachment, mix together the sugars, flour, baking powder, salt, and sprinkles on low speed until combined. Add the oil and vanilla and mix until it begins to come together and small clusters form. Use your hands to make more clusters as needed, and transfer crumbs to the baking sheet. Bake for 20 minutes, stirring halfway through. Remove from the oven and allow to cool completely. If making the crumbs ahead of time, they can be stored for a few days in an airtight container at room temperature. Preheat the oven to 350 degrees Fahrenheit and line the bottom of a 10x15 inch, rimmed quarter sheet pan with parchment paper. Spray the pan generously with cooking spray. In a medium-size bowl, whisk together the flour, baking powder, salt, and 1/4 cup of the sprinkles. Set aside. In a measuring cup, combine the buttermilk, oil, and vanilla extract. Set aside. Using an electric mixer fitted with the whisk attachment, cream together the butter and both sugars on medium-high speed for about 3 minutes. Add the eggs and beat for another 2-3 minutes. Reduce to low speed and slowly pour in the buttermilk mixture. Increase speed to medium-high and beat for about 4 more minutes until mixture is smooth, shiny, and increased in size. Reduce speed to low again and add the flour mixture gradually, mixing until just combined. Pour batter into the prepared baking pan and smooth evenly with a spatula. Distribute remaining 2 tablespoons of sprinkles evenly on top of the batter. Bake at 350 degrees for 28-32 minutes, or until cake is golden brown and toothpick inserted into the center of the cake comes out clean. Remove from oven and place the pan on top of a wire rack to cool completely. Using a stand mixer fitted with the paddle attachment, beat together the butter and cream cheese on medium speed until smooth. Gradually add in the powdered sugar, beating on low to combine. Add the vanilla extract, milk, pinch of salt, and squeeze of lemon juice, then mix to combine. Beat on medium speed until smooth. Whisk together the milk and vanilla extract in a small bowl or measuring cup. Invert the cake pan on a cutting board and remove the parchment paper from the bottom. Using a six-inch cake ring, stamp out two circles from the cake. The scrap will form the bottom layer of the cake (I cut out as close to a full circle as possible, then a small piece for the remaining edge of the circle). Tape a cake board onto a sheet pan and place the cake ring around it. Line the inside edge of the cake ring with a strip of acetate. Press the scraps together inside the ring to form the bottom layer. The top of the cake (part facing up when baking) should be facing *down*. Using a pastry brush, soak the bottom layer with half the birthday cake soak. Spread 1/5th of the frosting on top with the back of a spoon, then top with 1/3rd of the birthday cake crumbs, pressing them down gently. Spread another fifth of the frosting on top (be patient here - I find this to be the most frustrating part. It helps if you put a big dollop of frosting in, then spread gently from the inside toward the outer edges. It doesn't need to be perfect). Top with the second layer of cake (face down again), brush with remaining milk soak, then repeat step 4. If needed, add another strip of acetate (tucked between the cake ring and the very top of the first strip to increase the height to 5 or 6 inches). Stack the final layer of cake (top side facing up this time!) and cover with remaining frosting. Arrange the remaining birthday cake crumbs on top. Transfer the cake to the freezer and freeze overnight (at least 8-12 hours) to set the layers. About 3 hours before you want to serve the cake, remove from the cake ring and peel off the acetate. Transfer to the fridge to let it defrost. * To make your own cake flour: sift together 1 3/4 cups all-purpose flour and 1/4 cup cornstarch. Sift 4 times. Thanks for making it sound less intimidating. Not having to frost the sides of the cake is definitely a plus! Do you think I can set the cake overnight in the fridge instead of the freezer? I have a standard fridge with the freezer on top and a tall cake won’t fit in the freezer. Haven’t tried it that way, but I don’t think it will be too much of a problem. I figure it won’t set quite as firmly, and may be slightly messier when you remove the acetate strip, but it shouldn’t be a dealbreaker! Hmm…messy won’t be good. I’ll have to make it fit in the freezer somehow! 🙂 Thanks! If you can rearrange a little bit, the cake is only 6 inches in diameter, and about 5 or 6 inches tall! So it doesn’t need a ton of space. But if not, I really don’t think it’d be a big problem in the fridge. Your cake turned out amazing! We recently bought this cookbook and it’s one I really want to make but it requires so many ingredients that I’m a little overwhelmed… Would you make this again? This is great, I can’t wait to make one! Do the cake leftovers have to be refrigerated? Or if I’m taking it somewhere after defrosting and it won’t be refrigerated, is that ok? I was concerned about the milk soak and if it would go bad sitting out. Thanks! Hi Maria! I do recommend refrigerating the cake because of the milk soak and the cream cheese frosting. It will be fine out of the fridge for a couple hours (once it has set), but if you’re keeping it for longer than that, it’d be best if you can find a way to refrigerate it. Hi there! If you set it in the freezer overnight, it should be just fine to keep in the fridge during the day. The milk soak is optional, but it is a main component of the Milk Bar technique and will change the overall flavor/texture of the cake. I’d recommend giving it a try! Hi Monique, I purchased a 6-inch springform pan. Springform pans come with 2 pieces, a base and a ring. I used just the ring part to punch out the circles of cake. You should be able to get at least 8 slices out of a 6 inch cake. You could get a couple more if you slice very thinly. I just made it last night for my daighter’s 2nd birthday and to accommodate the larger group need doubled all the recipes (worked great!) and baked using one half sheet and one quarter sheet pans and then a 10” ring. I watched a couple 5 min YouTube videos of the cake construction and would recommend that to help visual learners like myself. MUCH less difficult than I was expecting looking at the recipes and instructions and probably one of the three best tasting and textured cakes I’ve ever made. LOVE this copycat recipe and can honestly say that I wouldn’t have made the original with its fake-to-mimic-boxed-flavor ingredients. Ah, this made my day! What a lucky two year old. 😉 And I’m so glad you were able to find some YouTube videos to help. The process totally seems much more intimidating than it is! I actually personally find this easier than a traditional layer cake once you get a handle on the technique. Do you think I could just make a buttercream frosting rather than the cream cheese frosting? I am worried the cream cheese adds stability and if I use buttercream the cake won’t be as stable….? Hi Samantha, you could absolutely make a standard buttercream frosting! It should be no problem. Freezing the cake overnight will definitely help give it stability. Love your version of the recipe! I did a ‘all-on-the-same-day’ version of it and DELICIOUS. Made 3 round cakes and just layered them without acetate. Refrigerated it for a few hours before serving. Soooo good. Held together fine. Lots of compliments 🙂 Thanks for adapting the milk bar recipe to one with easier ingredients!! Will be making this again. Hi Jess, I’m so glad you enjoyed the recipe and that you were able to adjust it a bit as well! Greetings! This sounds fabulous. I have been hesitating to make the original because I’m not a fan of shortening and some of the other artificial ingredients. I’m wondering if your recipe can be made in round cake pans and frosted like a regular layer cake? If so, what size would you recommend? Alternatively, can the batter be used in standard cupcake tins? Thanks so much. Hi Marlene, I felt the same way! I haven’t tried this recipe that way, but it should work just fine. I would recommend using 3 six inch cake pans. thanks so much for the recipe! have you tried it with the sugar content in the cake cut back a bit? it was very good, but I could do with a 1/4 less of the sugar. would it drastically affect the height or texture of the cake? thanks! Hi Charlotte, I haven’t tried it that way, but you could certainly give it a shot. I’m all for experimenting with baking to fit your tastes! It may change the texture, but it shouldn’t be drastic if you keep the change small. I love that you took such a popular cake from Milk Bar and create a recipe that was easy to follow. I made this cake and brought it into work and it was a hit. Everyone loved it! I will make this cake again for sure. I’m so glad everyone enjoyed it! What lucky coworkers! I typically use a 6 inch cake board, which should line up almost exactly with the edges of the cake. If you prefer to have more room on the board for maneuvering the cake, you could use an 8 inch cake board instead! I am currently making this and it looks great! I love the adaption with real ingredients/ not obscure ingredients. I was wondering how do you serve it. Do you serve it from the fridge, or do you let it come up to room temperature? Thanks! I will let you know how it turns out! Also, haha, do you wrap the cake in the freezer? I am making the cake a week ahead of time, so I am not sure if I should try to wrap it. It will be in a mostly empty deep freezer so I am not worried about smells. Thanks again! I am not necessarily a “new” baker, but I don’t really know what the “best practices” are, so any tips help! Hi Julie, I haven’t made the cake that far ahead of time, so I usually just leave it in the acetate/springform pan, on top of a small baking sheet, then cover the open top with plastic wrap. For freezing the cake longer, I would recommend wrapping it more securely in plastic wrap to make sure no air gets in, but I would still keep it setup in the acetate/springform pan. Try freezing it overnight to set, then wrapping as securely as you can in plastic wrap tomorrow. In terms of serving, I like to let it thaw completely in the fridge, then sit on the counter for an hour or so before serving. But since the frosting does contain cream cheese, I try not to leave it out for too long. Good luck! Planning this cake for a party in a few weeks, question about the cake crumbs, are they supposed to be cooked to a crunchy texture, or soft?